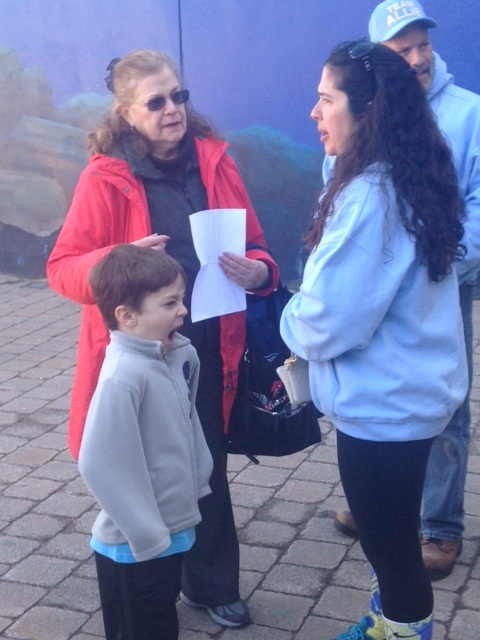 Esther Gómez-Nieto (in red) greeting attendees of a WDSD celebration at the Long Island Aquarium. We hear so much about how far a mother will go to help her child, but how about a grandmother? Well, Esther Gómez-Nieto organized a walk, started an art show, educated college students, started a foundation, and raised hundreds of thousands of dollars—all to support her grandson Alexander and others with Down syndrome! It all started in 2001, when Esther travelled to Arizona for the birth of her grandson. But shortly after her daughter-in-law had Alexander, the doctors determined that he had Down syndrome. Esther had never had any contact with individuals with Down syndrome, so she immediately set out to learn more. As she was researching Down syndrome, she came upon the Down Syndrome Research and Treatment Foundation (the LuMind Research Down Syndrome Foundation’s original name). Esther was able to hear a talk by Dr. William Mobley, currently the Chair of the Department of Neurosciences at UCSD and a LuMind-funded researcher. In Esther’s own words, she was “blown away by him” and knew that she had to help fund his important work on cognition. In the years since Alexander’s birth, Esther has been hard at work doing just that. She started by organizing the first Buddy Walk® on Long Island. That Buddy Walk® has been so successful that, in 2014, there were 2,000 walkers and they raised over $100,000 to fund local organizations and services, national advocacy organizations, and Down syndrome cognition research. But the Buddy Walk® wasn’t enough for Esther! She realized she needed help and found a community of like-minded individuals. In 2010, they became a 501(c)(3) organization called “Alexander’s Angels, Inc.” More than 30 people help Alexander’s Angels, Inc. as board members, officers, and members of various committees. All those hands come in handy as Alexander’s Angels has gone on to organize an exhibition, DOWNrightART, featuring the artwork of individuals with Down syndrome, and panel presentations on Down syndrome at local colleges and businesses. These activities have allowed Alexander’s Angels to contribute very generously to the LuMind Foundation’s mission of advancing cognition research for people living with Down syndrome. When asked why she made the decision early on to emphasize research, Esther Gómez-Nieto says that she realized that when you support research, you’re aren’t just supporting your child, your grandchild, or your local community. You are supporting every person with Down syndrome in the world, because discoveries made in the lab will impact people with Down syndrome everywhere. We at LuMind Research Down Syndrome are so grateful for Esther and her wonderful organization, Alexander’s Angels. Thank you for your generous support of our common mission to fund cognitive research to help people with Down syndrome lead more productive and independent lives. To learn more about Alexander’s Angels, you can go to their website at http://www.alexandersangels.org. Alexander may have been shy, but his family enjoyed the day at the aquarium. Alexander’s Angels families enjoying the sights at the Long Island Aquarium & Exhibition Center. Here’s a Walk team in front of the shark tank at the Alexander’s Angel WDSD event. This entry was posted in Blog, Ds Affiliate Organizations, Meet Our Friends, Why Support Research? and tagged Alexanders Angels, Buddy Walk, Down syndrome, DOWNrightART, Esther Gómez-Nieto, long island on March 23, 2015 by LuMind RDS Foundation's plus15 Blog.